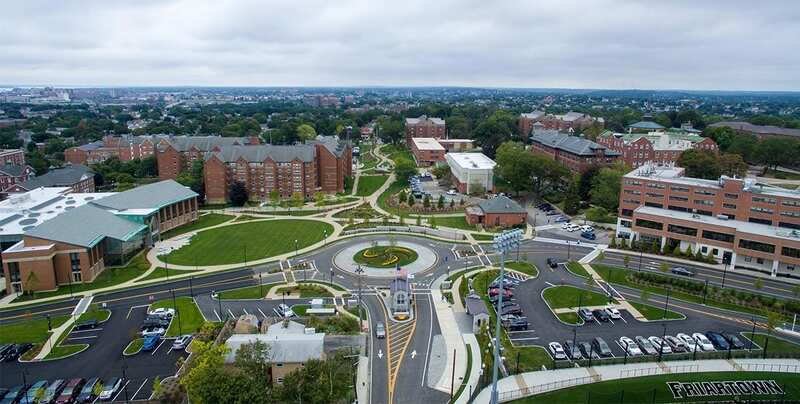 The transformation of campus — a major outcome of the “Our Moment” campaign — includes the greening of the former Huxley Avenue looking toward Eaton Street. At left is the new Arthur F. and Patricia Ryan Center for Business Studies, on the site of the former Dore Hall. At right is Raymond Hall. Providence College celebrated the close of its record-breaking fundraising campaign, Our Moment: The Next Century Campaign for Providence College, during St. Dominic Weekend, Sept. 15-16. The most successful campaign in College history raised $185 million, shattering the target of $140 million announced at its public launch in October 2014. It featured gifts from more than 35,500 donors, including alumni, parents, faculty, staff, corporations, and foundations. Forty-two percent of the College’s 56,000 alumni made a gift during the campaign, and 41 donors made commitments of $1 million or more. The seven-year Our Moment campaign transformed campus, enabling the construction of the Ruane Center for the Humanities, the Arthur F. and Patricia Ryan Center for Business Studies, the Ray Treacy Track and Field, and Chapey Field at Anderson Stadium. It established five endowed professorships and three endowed lectureships. The amount of financial aid and scholarships awarded to students increased by 45 percent, to more than $70 million annually, and 120 endowed scholarships were created. Gifts to the campaign enhanced research and study abroad opportunities, bolstered the implementation of a new core curriculum, and supported diversity initiatives and new programs, such as The Humanities Forum. The successful close was announced at a celebration on Saturday night in the Peterson Recreation Center that drew alumni, trustees, students, administrators, faculty, and staff. St. Dominic Weekend is an annual event during which the College thanks its most generous benefactors. At the event, College President Rev. Brian J. Shanley, O.P. ’80 said visitors frequently tell him, “I can’t believe what you have done” in transforming the campus. But most significant, Father Shanley said, is the campaign’s impact on students. The campaign also made possible the replacement of Huxley Avenue, a city street that bisected campus, with a landscaped walkway and a new entrance off Admiral Street. A softball field was built, and Schneider Arena and Mullaney Gym in Alumni Hall were renovated. Ongoing projects include an expansion and renovation of the Science Complex and the multiphase construction of the Ruane Friar Development Center, which will include a basketball practice facility, a new Center for Career Education & Professional Development, and an expanded and a renovated Slavin Center ’64 Hall. At the campaign celebration, Adam Hanna ’18 (Lakeville, Mass. 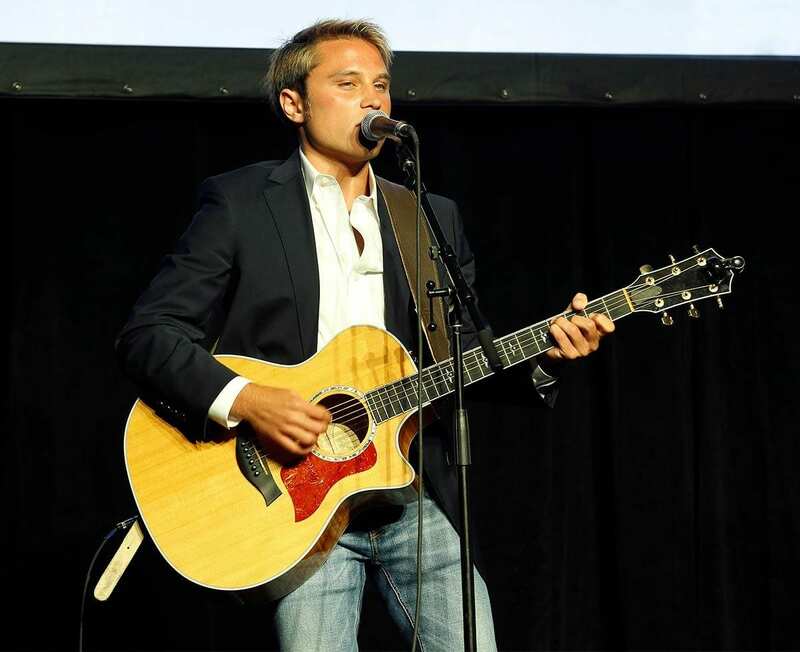 ), a singer and songwriter, played and sang a ballad, “100 Years,” that he composed for the occasion. “This is in honor of the last 100 years, it’s looking forward to the next 100, and it’s knowing that in some way, we’re all a part of both,” said Hanna. Students Quess-Symphonee Johnson ’21, left, and Tori Baggio ’18 thanked donors for their support. 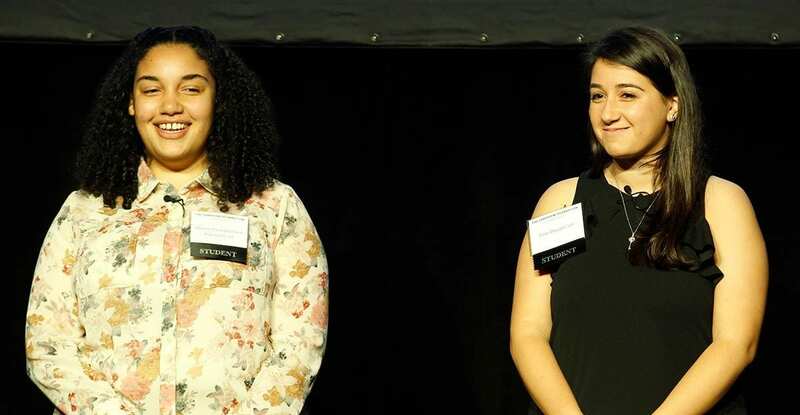 Two students spoke about how generosity affected their experiences. Quess-Symphonee Johnson ’21 (Central Falls, R.I.) participated in the five-week Friar Foundations Program during the summer. With other students, most from low-income and first-generation families, she lived on campus and took four courses for credit. Friar Foundations is made possible by gifts from the Angell Foundation, the Salah Foundation, and individual supporters. Baggio said she didn’t understand the importance of those words until three hours later, when she was wheeled off on a stretcher, bound for the hospital with complications of bronchitis. 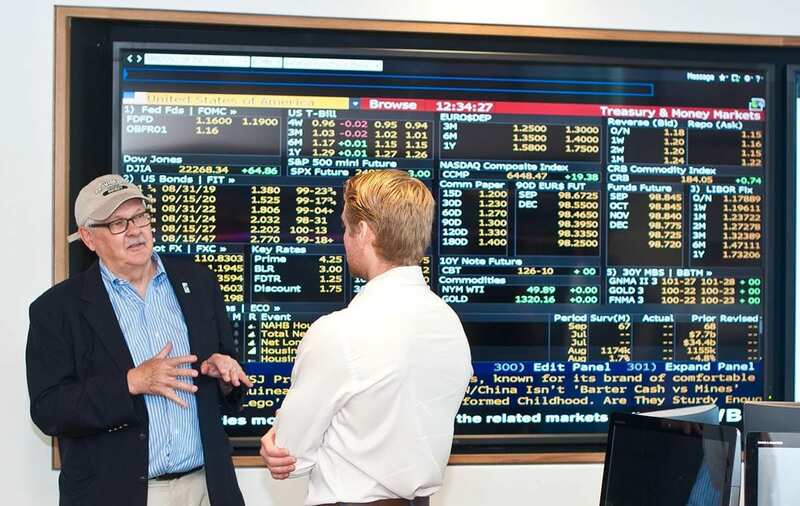 During a visit to the Arthur F. and Patricia Ryan Center for Business Studies, guests were able to view the new finance lab. Earlier on Saturday, guests sampled the student experience at PC. In the Ruane Center for the Humanities, they viewed the new stained-glass windows in the Fiondella Great Room, learned about student research in the humanities and sciences, and took part in a Development of Western Civilization lesson. In the Arthur F. and Patricia Ryan Center for Business Studies, Chris Riccobono ’01 discussed his apparel company, UNTUCKit, while in Schneider Arena, there were behind-the-scenes tours of new resources available to the men’s and women’s ice hockey teams and the lacrosse team. Co-chairs of the Our Moment campaign were Hon. William C. Leary ’60 & ’10Hon., retired probate judge for the district of Windsor Locks, Conn.; and Kevin C. Phelan ’66 & ’15Hon., co-chair of the Boston office of Colliers International, a commercial real estate firm. Both are members of the PC Board of Trustees.